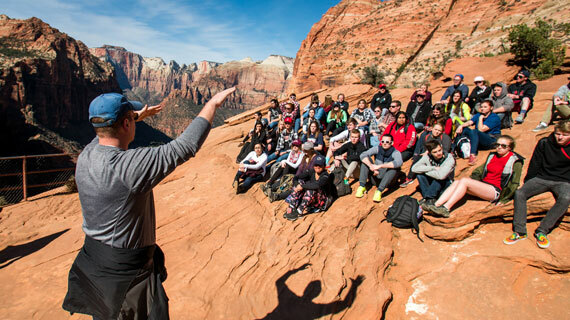 Southern Utah University is continuing to expand its innovative approach to general education. Launched in Fall of 2015 with 48 students, SUU’s Jumpstart General Education program is in its third year and is growing. The program now includes two sections with 84 enrolled students and has taught the faculty a few things along the way. 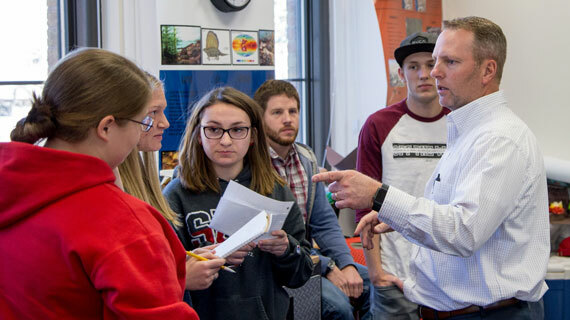 According to Dr. John Taylor, Jumpstart’s program director and SUU’s assistant dean for Integrative Learning, the Jumpstart program takes a lot of work to run smoothly. “You have to understand that the structure of the typical college or university is not such that it lines up well to pull off something like Jumpstart,” said Taylor. Each Jumpstart section is a one-year, 33-credit class that covers 10 courses worth of material. The program allows students to earn all of their general education credits through an integrated curriculum with a central theme, taught by seven professors. Typically, a college course appears on the schedule of either the fall or spring semester for both faculty and students. In Jumpstart, the courses are integrated over both semesters. The new format may be confusing for faculty and administrators and the logistics of creating and executing an educational experience like Jumpstart can strain the traditional systems of higher education. SUU has recognized these obstacles and has adapted to meet the unique needs of the program. One large change that occurred this year was the removal of the math requirement that used to be included in the previous years. Students are now given time in the spring to complete the math portion of their general education. This allows them to take the courses that meet their individual needs. Talking about the program’s unique nature, Taylor said that he can see why a lot of schools don’t do it, it's hard work. The retention rate of the first cohort was 88.6% and continues to be significantly higher than what the University typically sees. The integrated nature seems to ignite a spark in students giving them a greater sense of ownership over their education. “Jumpstart is one of the most innovative things I have had the opportunity to participate in as a faculty member,” said Dr. Bill Heyborne, associate professor of biology. “The opportunity to work with a talented group of faculty, from across campus, has been a really exciting experience. Watching my colleagues work has made me a better teacher and given me so many great ideas for improving my own practice." Taylor said that many of the students have formed lasting friendships as they learn, eat, camp, travel and grow with each other. Another hurdle that the program overcame was how grades were assigned at the end of a semester when the class is a year-long. Initially students were assigned temporary grades which showed students receiving a “T” for a grade. When students completed the year they would receive their final grades for all of the classes. Many organizations outside of SUU didn’t understand the process. That first year the NCAA initially ruled that Jumpstart students were ineligible to play sports because the students didn’t have a GPA for the first semester. Jumpstart isn’t finished growing. Taylor said that next year they plan to add another section to its program along with smaller versions of the program called Mini-Jumpstarts. They will also explore new and engaging themes for the curriculum in the future. Visit the Jumpstart website for more information or contact Dr. John Taylor at taylorjr@suu.edu.